Are You Searching Online for Tech Support Because Your Network is Running Slow, Hanging Up, and Causing Problems? Then It’s Time to Give Us a Call! No other IT consulting company in the Twin Cities metro and surrounding areas can match our fast response, customer service, or ability to deliver hassle-free solutions that work EXACTLY the way you want at a price that you expect. Our phone is answered 24×7 by LIVE, LOCAL, friendly people. We know there is nothing more frustrating than not being able to get things done because your computer is not working. With us, you will never have to wait around or chase us for a call back. We fix your problems FAST and ACCURATELY the first time. You should not have to deal with the same problem over and over again. We NEVER talk down to you, make you feel stupid, or confuse you with “Geek Speak.” You deserve answers in CLEAR, PLAIN ENGLISH. We will not do any damage to your network or data. We assure no disasters are waiting in the wings by first evaluating any potential risks before we even begin. We stand behind all our work with our Unconditional 100% Satisfaction Guarantee. If something is not right, we won’t quit until we fix it. We are certified and authorized partners with industry-leading vendors like HP and Microsoft. We are your one-stop-IT-shop for hardware, software, and support services. We PREVENT computer problems from happening in the first place. Our customized Invisik Care Packages enable us to fix and resolve computer problems BEFORE they turn into data loss, downtime, or other expensive situations. We complete all projects on time and within budget. We will not nickel-and-dime you as we perform your network services. We provide accurate and detailed invoices. With us, you never have to worry or wonder about what you are getting. Our first service call to you is FREE. If you are like some of our clients, you may have been burned and disappointed in the past by other tech support companies. We believe we need to earn your trust at no risk to you. That is why your first 2-hour service call to us is FREE. Let us earn your trust. Claim your FREE service call now! 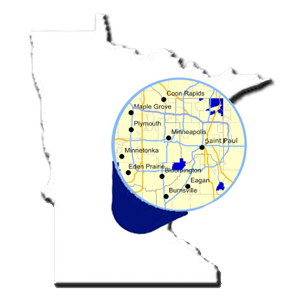 We provide small business network support throughout the Twin Cities (Minneapolis and St. Paul) and surrounding areas including Bloomington, Eden Prairie, Edina, Burnsville, Maple Grove, St. Louis Park, Plymouth, Minnetonka, Golden Valley, Lino Lakes, Woodbury, Lakeville, Richfield, and Shakopee. Do you need IT Support? First read this FREE guide for choosing the right support company BEFORE you call anyone! If you are a business owner looking for computer support then it's critical that you get and read this business advisory: An Insider's Guide to Choosing an Honest, Reliable, and Competent Computer Repair Technician. And just so you know, I couldn’t be HAPPIER with our decision to use Invisik for our IT support. Everything is working out great, your team is great to work with! You can trust Invisik with all of your IT needs. They are knowledgeable in all areas and has resolved many of our company's technology related issues over the past 10 years. Quick response time too. The biggest benefit we’ve received since hiring Invisik is peace of mind. It’s like Invisik has become a part of our staff, and cares about our network systems as if it were their own. Matt with Invisik is a fantastic person to work with. 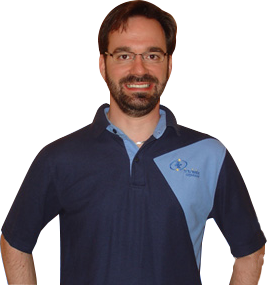 He is knowledgable about his field and enjoys helping his clients work through technical problems. One of his trademark gifts is maintaining a great attitude even in the midst of technical issues! "Invisik provides crucial IT support..."
Invisik provides crucial IT support services to their small business clients. Matt is knowledgeable in many different areas and is able to recommend solutions across different platforms. Invisik has been our IT provider for many years and Matt is an excellent business partner. He is efficient and proactive which gives us confidence that our IT needs are being met. I highly recommend Invisik for your hardware, software and planning needs.